Though Amtrak ridership reached a record high, and House Transportation Chairman John Mica has recently warmed to the idea of Amtrak-led high speed rail in the Northeast, it looks like the American train renaissance that some were expecting may take a while. The government is tightening its belt, if you hadn’t heard, and new railroads aren’t exactly an easy sell. In the meantime, if you’re looking for some vicarious train enjoyment—or the perfect Christmas gift for that hard-to-shop-for uncle, nephew, or Amtrak-loving Vice President—you might consider a virtual-reality model train. Train Simulator 2012, which was released in October, is impressively powerful and complicated—You can drive diesel or steam trains in and out of stations, add and subtract cars, move freight. It’s a little strange to get the hang of it, but the program offers tutorials to help you learn your way. As you pilot your iron horse, you can choose between a variety of views. You can sit inside the engine cab, inside the passenger car (with bored virtual people staring out the window), watch the train go by from an overhead “helicopter” position, or trackside. Depending on your aesthetic or emotional needs, you can vary the weather, build your own environments, or purchase separately ninety add-ons that let you choose from different rolling stock and routes including the Acela, the Pennsylvanian Horseshoe Curve, German High Speed trains, the British Hatchel Hill quarry. Just before halloween, Railworks offered an inspired expansion pack called Trains vs. Zombies, where you try to reach a hidden haven deep inside Paddington station (Hint: don’t pick up the dark gray stumbling passengers.) Coming soon? A Donner Pass situation, which may or may not include scenes of cannibalism. 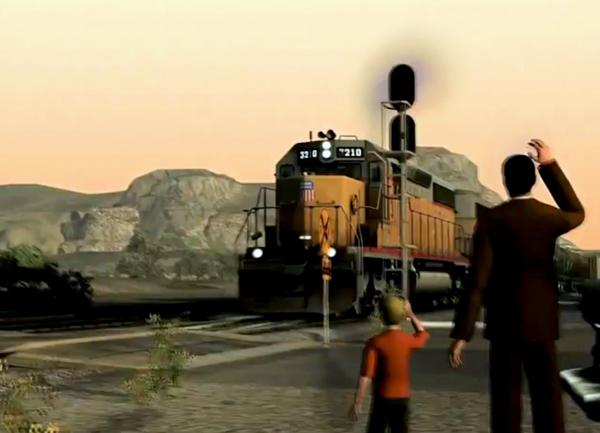 “Years later, I take my son down to the same crossing,” the Train Simulator trailer voice says. “I know now that he wants to drive trains too…. You know what? Now we can. Each and every day, as many times as we want, whenever we want.” You don’t even have to pass a surface transportation reauthorization bill through Congress first. (Though that would be an interesting role-playing game!) The program can be had for about the cost of a one-way ticket from New York to Philadelphia. Matt Dellinger is the author of the book Interstate 69: The Unfinished History of the Last Great American Highway. You can follow him on Twitter.